Though our culture seems to esteem the morning person (“The early bird catches the worm” and "Early to bed, early to rise, makes a man healthy, wealthy, and wise"), there are distinct benefits to being a night person. Sure, we may not be able to participate regularly in a pre-dawn fitness boot camp or arrive first at the office every single day. But when 8 p.m. rolls around, we still have hours worth of energy and motivation. As a night person, you have probably learned to adapt to the typical “morning-person” schedule, arriving at work at 8 a.m. and leaving at 5 p.m. Not only can you thrive on a typical schedule, though, you can also adapt easily to a less-standard day or extended hours. This capability enables you to excel on late-night shifts as an employee and helps you to handle extended hours as a business owner. Just because you aren’t at work an hour earlier than everyone else doesn’t mean that you can’t get things done. Your productivity may soar in the evening and, when deadlines loom, you can easily put in extra hours then. On workdays that last longer than usual, you still have time in the evening to relax. Then you can sleep on whatever work-related obstacles you may have encountered and enjoy problem-solving epiphanies the next day. Being able to have a lucid conversation in the evening can be a significant benefit for those who must work late or have colleagues in different time zones. If you are a night person on the east coast, for example, you are often ready to talk or exchange emails with your west coast colleagues in their late afternoons. Your freshness and availability can portray you as hard working, independent of whatever you have (or have not) accomplished earlier in the day. If you have interest in advancing a cause and serving people in less fortunate circumstances while expanding your network, developing new skills (which can help boost your workplace credentials), and contributing to society, then being a night person can be advantage. Many avenues of engagement with the community — such as leadership roles associated with non-profit organizations and volunteer opportunities with at-risk children — are available to those who have discretionary time and energy in the evening. 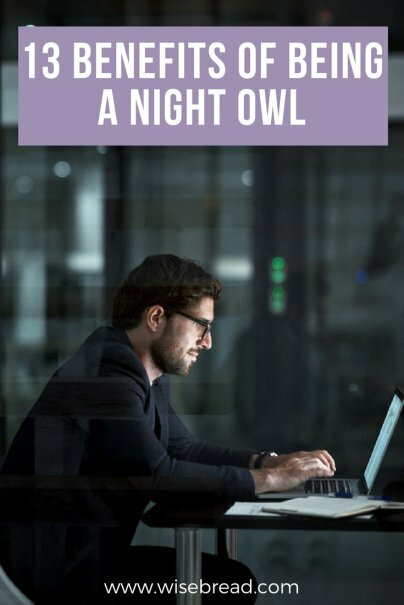 While the morning person can handle childcare and school preparedness in the morning, the night owl is invaluable to watching over young children at nighttime. You have the energy to hang out with them, watch (or play) their games, read to them, and get them ready for bed. The circadian rhythm of adolescents is well-documented. What you might not know is that teens often wait until midnight to disclose important information. As a parent, you may not be able to change their sleep patterns. But as a night person, you can stay awake to have meaningful discussions with your teenagers when they are ready to talk. As a night person, you have the physical and emotional reserves to visit with friends in the evening. You may be more likely to enjoy dinner, drinks, and conversation after hours. As a result, you can expand your social circle and deepen bonds with friends. When you are traveling on business, you have the energy to interact with colleagues, customers, etc. during conferences, remote meetings, and site visits. When the mandatory tasks are done during the workday, you can get to know people and connect with them beyond the business niceties during evening sessions. Late-night chats, for example, can be rewarding on a personal level and lead to business opportunities that may not otherwise materialize. The evening is a great time to work out, especially in the summertime. You can have a leisurely dinner and then go for a 5K run (or longer) at, say, 7:30 or 8 p.m. while there is plenty of light. You could also take a bike ride, walk, or visit the gym. In the morning rush, you may not have time for a great workout. But the evening holds many more possibilities without distraction. The nighttime is perfect for preparing yourself and your family for the following day. You can prep coffee for the morning, pack gear for an early start to an outdoor adventure, prepare meals or elements of an entrée or side dish for a potluck dinner, gather items for a crock pot meal at home, launder clothes for wear the next day, and more. Actually, I recommend that you go ahead and do these things at night because — if you are like me— you may not have the decision making skills and presence of mind to tackle them the morning. No matter how hard you try, if you are a true night person, you probably can’t get a good night’s sleep if you go to bed before 10 p.m. (or 11 p.m., if you are like me). That leaves an expanse of free time that you can either squander or use to enrich and develop yourself. On those evenings when you are not working out, volunteering, prepping for the next day, listening to your kids, etc., you have time to read, study online, or take a course at the community college. You might partake of your book club’s monthly pick, brush up on the latest business or social trend, or get inspired to take action that will improve your life and that of your community. My husband is a morning person, and I marvel at his ability to think clearly at 6 a.m. Though some marriages may suffer from morning-night conflicts, I have found that we are able to support each other more. While I may take care of the kids more in the evening, I can count on him to deal with morning crises and, on a more regular basis, make sure I get up on time for early appointments. As a night person, I especially appreciate a morning person's strengths. So, I especially value collaboration for school, work, and community projects because of my experiences at home. Leisure at night can give you the time and space to think deeply about whatever is happening in your life, specifically your personal dreams, career aspirations, and financial goals. Darkness can bring peacefulness, which can help you to contemplate your current situation. As a result, you may be able to think strategically, consider how to deal with underlying issues of existing problems, lay the foundation for future opportunities, and determine next steps that will help you realize your hopes for the future. As a night person, I have often felt diminished because of my lack of perkiness in the morning. First, just to be clear, please know that I can get up early and get things done if required. For example, I can arrive on time for 7:30 a.m. dental appointments or 7:00 a.m. starts for a bike ride. My regular rhythm, though, favors mid-morning productivity and nighttime activity. Counting the advantages of being more alert at night has helped me to use my natural capabilities even more. Are you a night person? How has that helped or hindered you in your career and personal life? I tried to become an early riser for years - I did wake up early. but my creativity plummeted. Thinking clearly at 5am is one thing, being creative at that time is something else. If you're a night owl, embrace it and don't try to change! Thanks for sharing your experience. I've tried getting up early also (before 6 a.m.) but can mainly do just simple things in the first couple of hours. Cool article, there's so much information out there about the benefits of waking up early but these are all true to the opposite type of people. I think the biggest one is #10. If you can't wake up early in the morning, the best thing to do is get completely ready for the next day the night before. I always sleep as long as possible before getting up for work, so the night before I get the coffee maker ready, put my lunch together and pack my bag for work. Glad you enjoyed the article. With more and more people able to work from home and/or required to interact with people in multiple time zones, I thought it would be nice to consider the benefits of being a night person. Also, as much as I think I should be able to get up early and get things ready for the day, I have finally realized that I need to pack at night so that I am ready to go the next morning. I immediately gravitated to this article because people rarely celebrate the night owl. I hadn't thought about it before but there are definitely some advantages to it, especially when it comes to social activities and planning. I'm kinda in the middle, I can get up early easily but I don't typically get sleepy until 11 pm. Though it does change a little as you get older. I figured it was time to tout some of the benefits of being more awake at night. Glad you liked the idea! A year ago, I was recruiting someone for a volunteer position that required night meetings -- she mentioned that being awake at night was difficult for her, something that had never occurred to me as a possible reason to forgo such an opportunity. (Fortunately, the meetings that she is required to attend don't run much past 8 p.m. so she is able to do well in this role). My patterns have changed over the years also. I get up a tad earlier than I used to but still have many mornings when I can't do much until I have had coffee and eased into the day. I always felt like my head was clearer at night, especially in college when I could trudge down to the computer lab (back in the day when having a pc or laptop was a LUXURY) and work on my papers. I usually could get more reading done as well. I think the lack of noise around me made me think clearly. I don't know how else to explain it, but I feel more productive in the evening when I get my second wind. Stay out late, have beer, sleep late, go to work late. Number 14. I feel as this doesn't really pertain to true night owls but just non-morning people. When I think night owls, I think people who function best between 12am-8am. Unlike your story says, it was an inhibition on my social life since there weren't many people who were up when I was. I did work a 9-5 office job but I felt like a zombie moving throughout the day, pumping myself full of caffeine to make it through. After that, I was sleeping on the train ride home, moving throughout a daily evening routine sluggishly, only to be amped by midnight. Mornings were miserable and the lack of sleep would just compound itself until the weekends where I could sleep until 8 or 9 pm. TBH there were no advantages at all, I was lethargic during all operating hours of the day. Fortunately, I had systems to work on cruise control where I would make sure to jot down all the info only to come back to the work at midnight when I could focus clearly and grind an all nighter...daily. I found it interesting you said you didn't get to bed until the earliest being 10pm, but for some we don't fully feel awake until 10pm. And who do you hang out with then? Well, all my friends would want to meet up past 1am. Which is great, until you realize you have to be awake in 6 hours. So by the time everyone meets up, by like, 1:30, you hang out for 3 hours, and it takes you half an hour to get home, you're pushing 5 am. Boom 2 hours of sleep! And this is not isolated to the young. The age range is quite large for this kind of lifestyle. But the circle is quite small. There is no networking involved seeing as how you can walk empty streets and find all the people to hang out with. No one considers you a hard worker if you're cranking out emails at 3 am, you look more just like a stalker in the night. So maybe your article is correct that people who are more alert at night have an advantage, but to call them night owls is far from the truth. The real truth is that night owls have a hard time adjusting. Night owls cannot function fully in the real world since the world stops running at a certain point, unless of course you have a profession dealing with Chinese businessmen all night and sleep all day. You have an excellent point about a non-morning person vs. a night owl. I do consider myself more of a night person but that may be b/c I have been able to make some adjustments just not able to do the morning thing or standard workday with ease. There are definitely disadvantages to being a night person and even more as you describe as being a night owl. I love the way you coped by putting in place automatic systems; I have learned to adapt in this way for certain tasks. Still, it's frustrating to be seen as not as big of a contributor or somehow odd b/c your internal clock differs from others or the standard clock. I think I internalized the idea that not being up and working (or getting a workout in) at dawn meant I was less motivated or driven to perform. We do have to adapt to circumstances but if possible (including the idea of running a business that has an advantage of crossing multiple time zones), we can use circumstances to benefit ourselves, our work relationships, families, and community.